Vintage fans often find that the wardrobe is simply too full to contemplate another great find. In such cases, the urge to acquire should be channeled into a different direction. Like the kitchen. 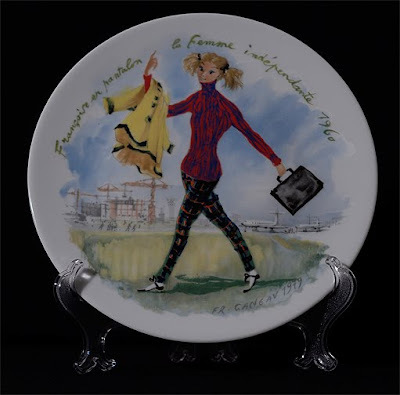 Because aren't these plates, part of the Les Femmes du Siècle series (1977-79) by Francoise Ganeau for D'Arceau-Limoges just great? 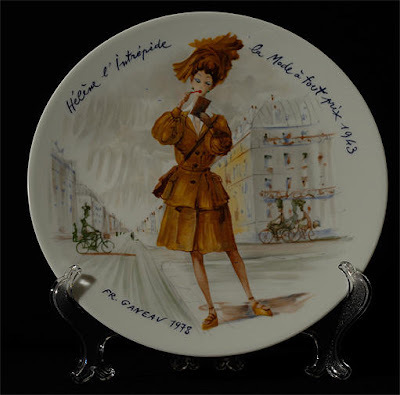 One hundred years of French fashion, charmingly inscribed with the names of the models and their signature traits. I love the little details. Like the cork-soled shoes on the intrepid Hélène, authentic to the limited resources of the war years. 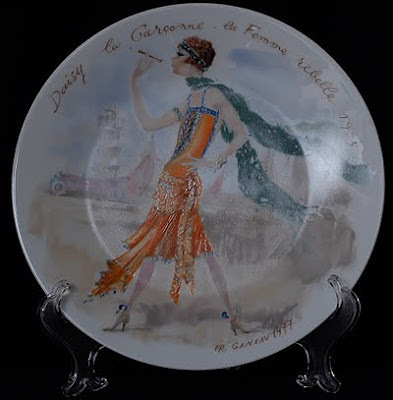 And the Isadora-style scarf and Fitzgeraldian name of flapper Daisy. Meanwhile Françoise goes for a walk in view of jet-set starting point Orly. If you've got a fair amount of disposable, the entire series can be had here. If you're minding the pennies (and who isn't these days) keep an eye out on the usual online outlets, for individual examples come up fairly frequently.